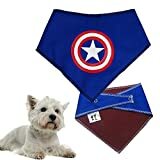 Spoilt Rotten Pets SMALL SIZE Super Hero Captain America – Avengers Bandana Cape For Your Pooch. Cotton Front and Soft Fleece Reverse – Adjustable Safe Popper Fastening. Worn With or Without Your Dogs Collar. Easy To Put On and Take Off. So Comfortable Your Dog Won’t Know They’re Wearing It. Tiny For Neck Sizes Between 6″ And Up To 10″ Suitable for Toy dog breeds, Chihuahuas, Toy Poodles, Puppies and Cats! Although we have provided some guidelines about which size is generally suitable for various breeds, every dog is different so we recommended if you can to please measure your dog’s neck. Size Small 4/5 (20mm). Tags on this listing are ONLY available in the color displayed. ;Stainless Steel with Enamel. ONLY available in color displayed. ;We will contact you shortly after purchasing for tag information. ;Fits 2 -3 lines, 12 characters a line including spaces. Stainless Steel with Enamel;Size Medium 1 1/4 (30mm);We will contact you shortly after purchasing for tag information. ;3-4 lines of engraving 16 characters a line including spaces. ;You pick the tag style and any of our 11 enamel colors.